Scalopus aquaticus, effect lawns, wood lines and garden bed edges, by forming raised tunnels just below the surface of turfgrass. These tunnels form three to five inch raised ridges that break the surface of a lawn. These feeding tunnels damage grass roots and quickly kills the mounded grass. You can catch these critters year round. Keep in mind they are most active when the soil is moist in the spring and fall of the year. This is also when the white grubs, earthworms, and insects that they feed on, move about on the top layer of soil. Most consider them to be beneficial since they feed on the larvae of insect pests. During this process, they also aerate the soil. 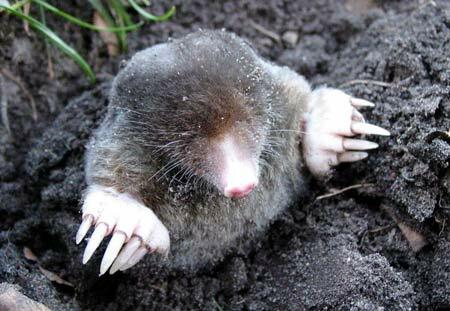 It is only when moles tunnel into turfgrass and uproot plants that they become a pest. Voles, mice and other rodents use abandoned mole feeding tunnels. If roots are eaten, a rodent may be to blame. Moles are not rodents. They are related to bats and shrews. You may begin to notice the typical large piles of soil in your yard, that liken the look of a volcano. These piles of soil are the result of moles ascending from their runway tunnels far beneath the surface. Moles retreat to these tunnels when they are not actively feeding. These are called runways. Multiple volcanoes of dirt usually form a line along the main runway. Mole runways are out of site, twelve to eighteen inches below ground level. Moles breed in early spring, otherwise they live mainly solitary lives. Other than during breeding season, you will only find one mole in a feeding tunnel. One tunneling mole may be responsible for a large amount of turfgrass being damaged. Commonly population densities are approximately 3-4 moles per acre. Start controlling moles as soon as you see damage. There is no need to wait for a specific time. Usually trapping one to three moles is sufficient population reduction. Avoid placing traps on the top of mole mounds. By doing so, you will not produce results. Instead, traps should be placed inside of active feeding tunnels. To determine if a tunnel is active, you can collapse a tunnel with your foot. If the collapsed tunnel has been repaired the following day, then that tunnel is active. Since feeding tunnels are temporary, you may have to set a trap in the runway, which is used year round. Purchase only traps made specifically for moles.Mole traps are expensive. Look for harpoon traps and scissor-jaw traps. Traps for voles are not compatible. Vertical pressure from a moles back, triggers a mole trap. Straddle or suspend the mole the trap with the tunnel. If a mole comes into contact with a foreign object, he will likely close off that portion of the tunnel. Moles have very sensitive noses. For detailed mole trapping instructions check out this great article. Other methods of mole control are available. These methods are not as effective as trapping. Controlling the population of grubs, insects and worms that moles feed on is not recommended. Earthworms are beneficial and a mole’s diet is too diverse for this method to deliver much of an effect. Mole baits are being developed and researched to improve effectiveness. Common grain based baits are not effective since moles feed on insects. Gel baits containing bromethalin and warfarin are effective methods of control. Like traps they must be placed in active tunnels. Repellents work but tend to just relocate moles to a different area. Castor oil based repellents work the best on our Eastern Mole. There is also the mole plant, Euphorbia lathyris. This plant is thought to repel moles naturally. Since mole tunnels are extensive, flooding a burrow is rarely effective. Underground barriers and other exclusion methods help, but are not usually effective long term.